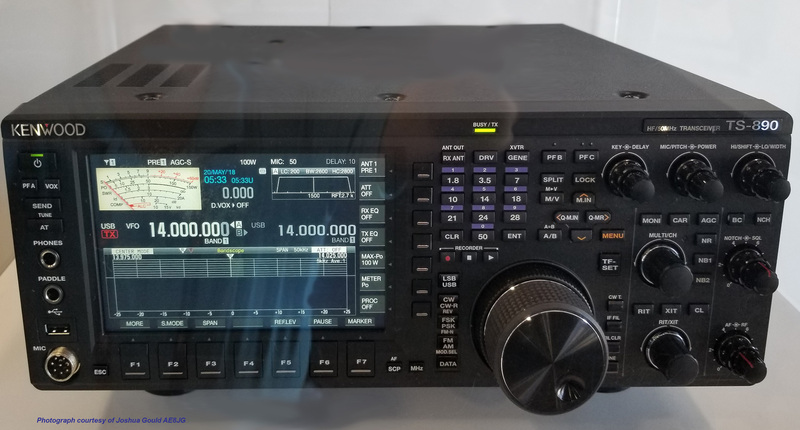 The Kenwood® TS-890S transceiver made its world debut at the 2018 Hamvention® in Xenia, Ohio. A prototype was available to view under glass. Operating 160 to 6 meters, it features full down conversion receiver with h-mode mixer and High C/N 1st LO. It has four built in roofing filers: 500 Hz, 2.7 kHz, 6 kHz and 15 kHz (optional 270 Hz). The TS-890S has a 7 inch color TFT display with roofing frequency sampling independent band scope, auto scroll mode, USB audio, 120 memories, multi information screen, DVI-I. Remote control operation with direct IP connection (without computer) is supported. A 100 watt heavy duty built-in antenna tuner is standard. Requires 13.8VDC at 22.5 Amps. Kenwood is offering both the ARCP-990 Radio Control Program and ARHP-990 Radio Host Program as free downloads from their website.